The whole week was a blast! Starting off with the tennis/volleyball mash, then the wine tasting/pizza dinner, the school tour, golf get-together, the Friday night karaoke (which was a scream), and then finally Saturday evening when over 200 of us joined together, met old friends,and forged new friendships, the whole week was something to remember. I had the most wonderful time of my life going back to school at the 40th reunion. We danced all night long, just listening to the wonderful music and we talked about old time, with the drinks flowing like water. I now see that we are all getting over the hill. I'm so sorry that some of my classmates chose not to come....but they should have been there. We don't know how long we have on this earth and we all should stay connected and appreciate this time in our lives. My husband and I attended the karaoke function and it was great! A couple of singers were really laid back, but they warmed up and surprised us with professional caliber renditions. I didn't know our class had so much talent! And yes, we did wear out our welcome with "Johnny Angel" but I'd sing it again! The food was awesome too! And believe me when it comes to food, I know what I'm talking about! I didn't get a chance to attend the other events but I have only good things to say about the main event. The Ala Moana Hotel was a great place to host it and the food was really ono, especially the roast beef! Entertainment was primo! What especially warms my heart are the fond memories that were created by connecting again with my classmates and dear friends. Thank you all again. It was a wonderful night.- Rob Yamamoto. Thanks to...the alumni who were instrumental in pulling all the events together so successfully. I had a wonderful time and much appreciation to Larrene for the name tags. It was a fabulous idea that made it so much easier to connect with everyone at the events. The music was great, but my only comment is that it was way too loud and made it difficult to talk to everyone. At our age, some of us have a harder time hearing under noisy conditions-oh yea, paybacks for sitting in the front row at all those rock concerts. Yes, your children/grandchildren shoud know that we used to and can still ROCK OUT! It was the best reunion that I have ever attended. Very well planned and organized!! Great job! Thank you for your hard work to make our 40th so successful! WOW!!! I was so glad that I got to attend both the karaoke and reunion events. Karaoke night was a blast, I spent quality time with everyone there, especially Iris S. I don't care about the "threats" we got or what anyone said about our "Johnny Angel". We still love him and will keep singing about him. Right, girls!? I know the guys were digging it!!! Mahalo for all the fun events, and the time taken by all on committees, planning and hosting. It takes a lot of organizing to entertain and get people together, so I certainly appreciate all those who contributed to a great reunion. It was fantastic to see so many old friends and to reunite with classmates for the first time on an adult level....On behalf of my husband and myself, we could not have had a better time. It was one of his favorite trips to Hawaii and he is looking forward to Las Vegas. So thanks to all who made this reunion super. Aloha...I wanted to get this thank you note to express my appreciation for all the great work that each of you had put together in planning our 40th Year class reunion. I had a great time being able to see friends that were not at previous reunions and just to see them knowing that they are all still alive and well. 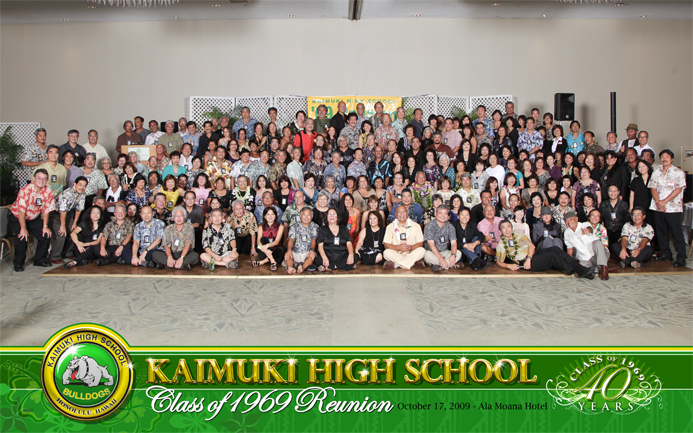 It was a great week of getting together with people that graduated from one high school.... Just the sense of belonging to Kaimuki High School Class of '69 was awesome. Having a bunch of things to do together especially when it might lead to seeing someone that I hadn't seen in 40 years was a good enough reason to come and to be there. I realize everyone has a different experience of being in high school. And If you're reading this, chances are you must have had some good friends in school, or at least people that you enjoyed hanging out with and spent time enjoying some part of your life. I just figured once in awhile someone would give themselves the treat of being able to reconnect with people that you might have enjoyed sometime in your life. Just a thought, that maybe you'd want to see them before life was done. I had an incredible time and was so happy to see friends that I haven't seen in 40 years. I hope to keep in touch with those that I lost contract with till now. Although I only attended two events, I could imagine all events were fun filled and well organized. I will say this, in my opinion, the Reunion could not have had anything more nor anything better than the way you all organized it with food, entertainment and choice of place to gather. I believe the turnout was spectacular! I will remember that moment in time with a smile and special place in my heart. Reunions through time seem to have a life all their own, or at least seem to have evolved since I last attended some 15 years ago. At last night's event, the wine tasting, I got a real sense that we old Kaimuki High Class of '69er have settled into a very different stage in life. We all appear to have mellowed with time and are much, more comfortable in our skin, so to speak. Two decades ago, I'm quite certain that many of us were still a bit worried about how we looked, where we were in our careers and the like. Not so, last night. We were happy to see each other, talk about the silliness of our time at Kaimuki and really talked about our kids and what we look forward to doing in the sunset of a career. It was very nice. We've appeared to have mellowed nicely. It was great to see people we have not seen in a while. I told Rosemary (Matsueda) Chong that I only see her on the television when she stages that amazingly successful Friends of the Library book sale. I have not seen Rosemary and Gail (Kogawa) Ikeda in a very long time. Luana Rees still looks very trim and athletic. My goodness, I'd say that she could probably still get on the volleyball court and do some damage. Wendell Ogitani and Guy Takiguchi who attended all the events!